To publicize the 2011-2012 One Book Villanova Hotel on the Corner of Bitter and Sweet events, Falvey graphic designer Joanne Quinn filled the first-floor cultural window with paper parasols, Japanese lanterns, books, Bitter and Sweet street signs and a slide show of historic photographs. Hotel on the Corner of Bitter and Sweet is “a work of fiction” although “many of the events … did occur as described,” according to author Jamie Ford. The novel deals with past and present as seen through the eyes of Henry Lee, a Chinese-American. During World War II, Lee was twelve years old when his close Japanese-American friend, Keiko, the only other Asian in their school, was among those relocated to internment camps. In addition to a collection of library books that deal with the World War II Japanese American incarceration, a digital picture frame with a fascinating slide show of black and white photographs illustrates events of the period. The books are available for interested readers. The street signs represent the fictional but appropriate address of the Panama Hotel, a real Seattle hotel located on South Main Street. 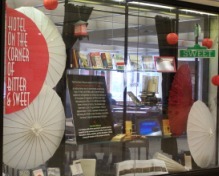 Large paper parasols on the left and right sides of the window refer visually to a passage at the beginning of the novel in which the Panama Hotel’s new owner discovers possessions, long stored in the basement, belonging to the Japanese-American families who were taken from Seattle to internment camps. A large placard explains the One Book Villanova concept and provides a brief synopsis of Hotel on the Corner of Bitter and Sweet. Joe Lucia, University librarian; Terry Nance, PhD, assistant vice president for Multicultural Affairs; and Thomas Mogan, director of the Office of Student Development, are the 2011-2012 co-chairs of the One Book Villanova committee. One Book Villanova began in the 2005-2006 academic year as the result of a conversation between Lucia and Dr. Nance. They believed that “books and ideas matter” and that a “one book” program would provide students with opportunities for discussion “about the pressing issues and questions of our time.” Others joined them in the development of the program. Previous One Book Villanova selections have been The Unforgiving Minute by Craig Mullaney, Rooftops of Tehran by Mehbod Seraji, The Glass Castle by Jeannette Walls, Left to Tell by Imaculée Illbagiza, Blood Done Sign My Name by Timothy Tyson and The Kite Runner by Kahled Hosseini. How fun! I love to see parasols used as decorative elements.